SpaceX's third Dragon space capsule mission launched to the International Space Station from Cape Canaveral on April 18, 2014. Dragon capsule has been released and floats away from the Falcon 9 launch vehicle. A commercial cargo vessel is chasing down the International Space Station, setting up a rendezvous with the orbiting lab early on Easter Sunday (April 20). SpaceX's unmanned Dragon spacecraft launched into space Friday afternoon (April 18) from Florida's Cape Canaveral Air Force Station, riding a SpaceX Falcon 9 rocket to orbit in a smooth liftoff. Dragon is due to be grappled by the space station's huge robotic arm at 7:14 a.m. EDT (1114 GMT) Sunday, then berthed to the orbiting complex a little over two hours later. You can watch Dragon's capture and berthing live here on Space.com beginning at 5:45 a.m. EDT (0945 GMT) Sunday, courtesy of NASA TV. A SpaceX Falcon 9 v1.1 rocket blasts off for the International Space Station carrying an unmanned Dragon cargo ship on April 18, 2014. The mission launched from Cape Canaveral Air Force Station in Florida and is SpaceX's third cargo delivery for NASA. 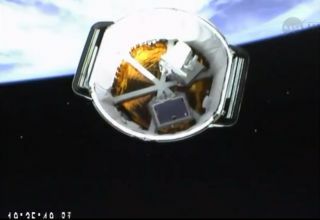 Dragon has embarked upon the third of 12 resupply missions SpaceX will fly to the space station under a $1.6 billion deal with NASA. The capsule is carrying nearly 5,000 lbs. (2,268 kilograms) of food, supplies, and scientific experiments, which crewmembers of the orbiting lab's Expedition 39 will offload when the hatch between the two vehicles opens on Sunday morning. It's unclear if Dragon is toting chocolate eggs, jelly beans or any other special Easter treats for the astronauts. "I don't know of anything," Bill Gerstenmaier, NASA associate administrator for human exploration and operations, told reporters after the launch Friday. "It'll be a surprise for all of us when they open the hatch." Items on Dragon's official manifest include a pair of legs for NASA's humanoid Robonaut 2, which is designed to be a sort of robot butler for astronauts, along with a plant-growth experiment called Veg-01 and a NASA laser-communication experiment called OPALS (Optical Payload for Lasercomm Science). SpaceX is one of two companies that fly robotic cargo missions to the space station for NASA. The other, Orbital Sciences, holds a $1.9 billion contract to make eight flights using its Antares rocket and Cygnus spacecraft. Orbital launched the first of these missions in January. Cygnus will visit the orbiting lab next, with a liftoff likely coming in June if all goes well with the current Dragon flight, Gerstenmaier said. Editor's note: You can see SpaceX's Dragon spacecraft in the night sky tonight, weather permitting, if it is passing over your hometown and you know where to look.